Immediately after the surrender on 8 May 1945, the Allies decided to clean up Germany's past and at the same time forced them to open their eyes to the atrocities of the Third Reich. One thing were the measures decided upon at the Potsdam Conference, such as demilitarisation, denazification and dismantling of the cartels. The other was judging the Germans. Keyword: Nuremberg Trials. The first prisoners arrived in Landsberg am Lech as early as autumn 1945. 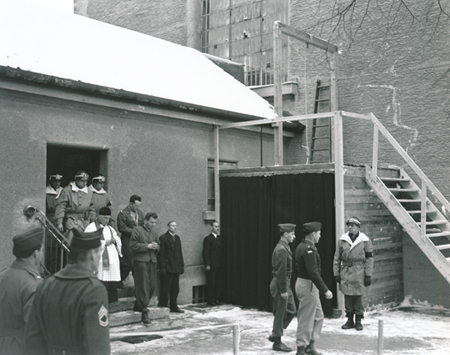 Even before the much better known Nuremberg Trials began, the Americans had condemned the first war criminals in Dachau, who had to answer for their crimes in the so-called concentration camp trials or airmen murder trials. Three of these convicts were handed over to the executioner as early as 19 November, 1945 (nevertheless, the judgments in the Nuremberg main war crimes trial were not pronounced until 1 October, 1946). The former "Hitler prison" was converted into the War Criminal Prison (WCPL) No. 1 by the Americans and thus also became a place of execution. According to historian Thomas Raithel, by mid-December 1947908 prisoners including women were already in the U.S. penal institution, following an initially weaker occupancy rate. In the meantime, 110 "Nurembergers” (convicts of the subsequent Nuremberg Trials), including industrialists, diplomats, ministers, high-ranking military personnel, doctors and bankers, in short, the "who's who" of National Socialism, had joined the "Dachauer”. These invicts, plus those convicted in the Shanghai trials, reinstalled old hierarchies among the prisoners. After their transfer from China to Landsberg, the "Shanghai Men" filed suits against their conviction. The verdict, in turn, should play a role in the Bush administration's Guantanamo policy after 11 September, 2001. In general, lawyers played a very special role, which the institutional clergymen of both churches were in no way inferior to. Soon, Nazi and war criminals turned into heroes, even martyrs. Oswald Pohl, who had been Himmler's deputy here and there, was one of those under the care of the Catholic chaplain Karl Morgenschweis. He transmutated from one of the most cruel SS men into a Christian, meek as a lamb. The message, that basically most were innocently exposed to the victor’s justice, had not only spread in Landsberg, thanks to files and secret documents smuggled in and out and the lies and legends woven from them. The networks spread all the way to America, where people like Joseph McCarthy distinguished themselves. The idyll at the river Lech increasingly developed into the place in Germany with the greatest symbolic power of post-war revisionist activities. They peaked at the beginning of 1951. With a large-scale demonstration on Landsberg's main square, thousands protested against the execution of the remaining 28 sentenced to death, or rather against the death penalty, which was abolished when the Federal Republic of Germany was founded in 1949. The truth is, it was a sign of sympathy for the war criminals. The last executions took place on 7 June,1951, after countless submissions and resolutions, even addressed to Pope Pius XII. Although he had to alleviate numerous sentences due to public and political pressure, High Commissioner John McCloy insisted on their execution. On 9 May 1958, 13 years after the surrender, the WCPL was returned to the Bavarian judiciary.